Pune: While the central government is yet to transfer land for Pune Metro, delaying part of the project for months, the state government, Pune Municipal Corporation (PMC) and Pimpri-Chinchwad Municipal Corporation (PCMC) have been prompt in ensuring that the required land is made available without much hassle. Officials of Maha Metro, the implementing agency for the project, said the crucial support from the three bodies has helped them push the project, but it has run into a hurdle because of the delay by the Defence Ministry. 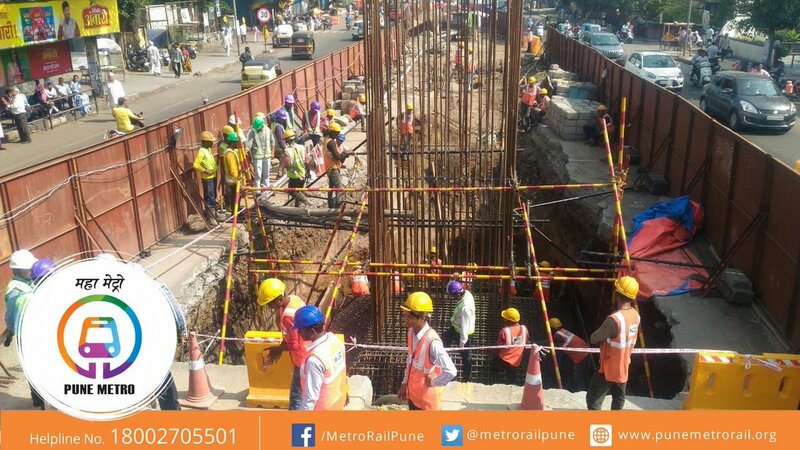 Initially, Pune Metro officials were looking for 41 hectares of land for implementing the project. Since the project started 20 months ago, the state government and the two municipal corporations have collectively handed over 33 hectares of land. A senior official of MahaMetro said that “The total land required from the state government, the two local civic bodies and private parties stood at 37 hectares. Of which, 33 hectares or 88 percent of the land has been acquired. And the remaining 12 percent will be acquired soon”. Around 4 hectares of private land is also needed for the Metro project. The official said “The process is underway. We are hopeful about acquiring the land in the near future”. The Pune Metro project also needs approval from the Defence Ministry for around 4 hectares of land in the Khadki Cantonment area. As reported by The Indian Express, the proposal for acquiring 4 hectares or 10 acres of land has been pending with the Defence Ministry for 10 months. Both Union Minister Prakash Javadekar and Pune MP Anil Shirole are pursuing the issue with the Defence Ministry. The Army on Tuesday said the delay was because the state government had not suggested an alternative land in lieu of the land to be acquired. Metro officials, however, expressed surprise at the Army’s contention. “At a meeting with Defence Minister Nirmala Sitharaman, Chief Minister Devendra Fadnavis had promised that if the Army needed land in Ahmednagar, the government will provide it to them without any delay. Metro official said that the CM’s response came after the Army requested an alternative land in Ahmednagar area”. “We are looking for similar support from the Defence Ministry. We hope our proposal will be approved by the Ministry as soon as possible”. Metro officials said if the project was delayed further, it would not be able to meet its 2021 deadline.